Let us help you invest, build your future or build your dream house! The program is open to Filipinos and non-Filipinos residing and working in Japan who are interested in purchasing residential real estate in the Philippines. Refinancing of existing residential unit, provided said property has been acquired by the borrower one year or less from date of application. For refinancing of existing loan, the loan proceeds shall be released directly to the financial institution. Proceeds of the loan shall be released in Philippine Pesos (converted from Japanese Yen at the Bank's prevailing buying rate for telegraphic transfers on the day of release of the loan) directly to the former owner/seller of the property or financial institution. The loan will be secured by a Real Estate Mortgage (REM) over the property to be financed that will be annotated on the title. Real estate properties other than the property to be financed are also acceptable as additional collateral. the aggregated area of the lot will not exceed the maximum allowed in case of former Filipinos. The loan will be paid in equal monthly amortization for a period of one (1) year up to a maximum of ten (10) years. 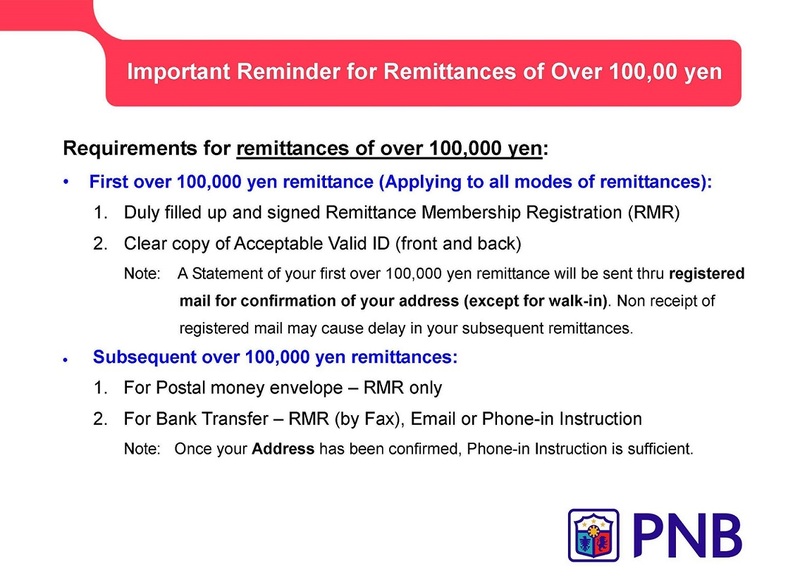 Borrower will be required to open a Yen Savings account maintained at PNB Tokyo Branch where monthly amortization and other related expenses will be automatically deducted on their due dates. The loan may be prepaid in full or in part subject to a prepayment fee of one percent (1%) of the amount of prepayment. Written notice must be furnished to the Bank at least 10 days prior to the intended date of repayment. Prepayment fee shall not be collected if prepayment is done on the anniversary date (interest re-setting date). Send a completed application package to PNB Tokyo together with supporting documents. Original Certificate of Employment indicating date of commencement of employment, present salary and position. If self-employed, Business Registration Certificate. Income Tax Returns (Kakutei Shinkoku) or Withholding Tax Certificates (Gensen Choshuhyo) for the past two (2) years. If self-employed, copy of tax payments for the past two (2) years. Duly approved building remodeling or building permit from City Engineers Office. Upon receipt of complete application package, a formal appraisal and credit investigation report will be requested from PNB Head Office to check the credit worthiness of applicant. Analysis will be conducted in accordance to existing credit standards, taking into consideration the following: Applicant’s character, capacity to pay, tenure of residence and employment. The approval evaluation process will take approximately four weeks from the time PNB receives all required documents and will be contingent upon receipt of acceptable appraisal figures on the proposed property. Decision will be conveyed to the application in writing. Upon final approval, legal documentation will be prepared. Collection of JPY 25,000 application fee will be made upon acceptance/conformity of the Facility Letter. Loan related documents will be signed by the borrower in Japan. This will require notarization by the Philippine Embassy in Japan.f borrower is a non-Filipino, all loan documents should be notarized first by a Japanese Notary Public then authenticated by the Gaimusho, and by the Philippine Embassy. Group Mortgage Redemption Insurance coverage will be required for loan on purchase of lot while both Group Mortgage Redemption Insurance and Fire Insurance Coverage will be required for loan on purchase of house and lot. These must name the bank as beneficiary. Original copy of TCT/CCT under the name of the borrower, free and clean from any liens and encumbrances, fully signed pertinent documents from the seller/developer, and annotated registration of Real-estate Mortgage (REM) from the Registry of Deeds must be submitted to PNB Head Office prior to loan proceeds being released to owner/seller. Original Transfer/Condominium Certificate of Titles (TCT/CCT) are kept at PNB Head Office for safekeeping while copies are forwarded to PNB Tokyo for the branch’s file. For accredited developers, upon borrower’s conformity, release of loan proceeds will be allowed upon execution of Deed of Undertaking by the developer. The entire process, including appraisal, filing, completion of documents and loan release is expected to take approximately three (3) months or more. It all depends on the completeness of the documents and the swiftness of the seller/developer to transfer the ownership of the title to the borrower's name. The loan approval is only valid for 180 days or 6 months from the date of approval. Beyond 6 months, the bank needs to reevaluate the application. 1% of the loan amount equivalent in JPY or JPY 25,000 (whichever is higher) will be charged as arrangement fee at the time the loan is released. Thereafter, schedule of amortization/repayments will be sent to the borrower right after the final release of the loan. Amount of previous loan to be cancelled x 10%. Result shall be then referred to RD Schedule of Fees. All late payments shall be equal to 18% of the amortization amount. The bank will attempt to collect 18%/annum on all delinquent accounts. Series of demand letters will also be sent to the borrower. After 90 days past due, the bank reserves the right to proceed with the immediate foreclosure on the property.